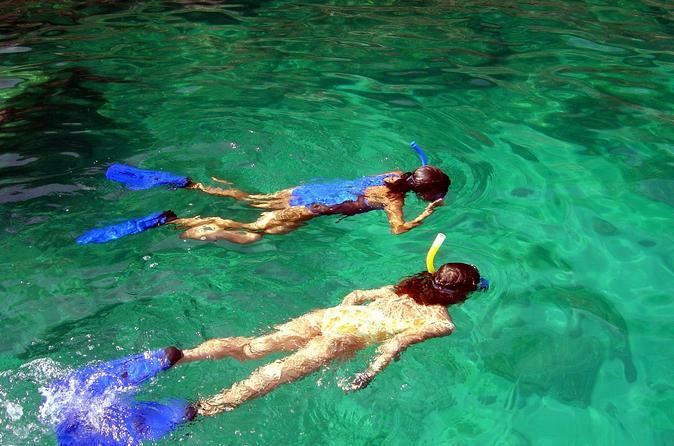 Explore the beautiful waters around Acapulco on this 4-hour tour to La Roqueta Island. Cruise from Acapulco to the island, where you can relax on the lovely sand beaches and enjoy snorkeling in the pristine waters teeming with colorful marine life. Cruise over the azure waves of Acapulco Bay to La Roqueta, a rocky isle dotted with paradisiacal beaches and secluded coves that are perfect for snorkeling. Swim in balmy waters that teem with colorful tropical fish, and enjoy a picnic lunch on the beach before the return trip to shore. After being conveniently picked up from your hotel, hop onto a skiff for a 30-minute boat ride across Acapulco Bay to the craggy and verdant Isla de la Roqueta. Snorkel through its rocky coves for a look at the island's vibrant marine life, lounge on the sands of Playa Roqueta, and snack on a picnic lunch under the shade of a rustling palm tree. You can also spend some time trekking through the lush flora of the island's seaside and jungle pathways for sweeping views of the expansive Pacific, the beaches of Acapulco, and the working lighthouse that tops the island’s highest hill.